Writer, abolitionist and reformer Harriet Jacobs (1813-1897) was born a slave in Edenton, North Carolina, the daughter of two slaves owned by different masters. The story of her life, Incidents in the Life of a Slave Girl, Written by Herself, published under the pseudonym Linda Brent in 1861, helped build Northern sentiment for emancipation during the Civil War and was probably the only slave narrative to deal with sexual oppression as well as oppression of race and condition. During her childhood in Edenton, young Harriet lived with her mother as part of a close-knit family. When Harriet’s mother died in 1819, the six-year-old girl was taken into the home of her mistress, Margaret Horniblow, who taught her how to read and write. Harriet was very fond of Miss Horniblow and expected to be emancipated. Instead, when Miss Horniblow died in 1825, she willed Harriet to her three-year-old niece, Mary Matilda Norcom. Within two years of moving into the Norcom home, Harriet found herself the object of Dr. Norcom’s unwanted sexual advances and Mrs. Norcom’s vindictive jealousy. In 1829, she began a liaison with Samuel Treadwell Sawyer. The couple had a son, Joseph, in 1829, and a daughter, Louisa Matilda, in 1833. In retaliation, Norcom sent Harriet to one of his plantations to be broken in as a field hand. Before her children could be sent to join her, Harriet ran away and went into hiding at her grandmother’s house. Her maternal grandmother, Molly Horniblow, had been emancipated during the American Revolution, sold back into slavery as a prize of war, and was re-emancipated in 1828. Harriet hid for six years and eleven months in a space under the front porch roof of Molly Horniblow’s house. In 1842, Harriet Jacobs escaped from Edenton by boat, traveling eventually to New York, where she went to work as a nursemaid for the family of abolitionist Nathaniel Parker Willis. For the next few years, she traveled between New York and Boston, eventually reuniting with her children. During this period, she became active in a circle of anti-slavery feminists and met Amy Post, who, along with Mary Willis, would eventually encourage her to write the story of her life. In order to subvert the continued efforts of Jacobs’s former owners to re-enslave her, the Willises eventually bought Harriet and gave her her freedom in 1852. The next year, she began work on Incidents in the Life of a Slave Girl. Her first two attempts to publish the book came to nothing when both publishing houses that accepted the manuscript went bankrupt. She finally purchased the plates of her book and had it published by a Boston printer “for the author” in 1861. The book contained a preface written by Lydia Maria Child, an abolitionist writer. The British edition, The Deeper Wrong, was published in 1862. 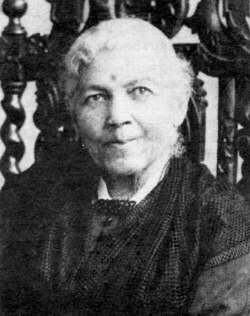 Through the war years, Harriet Jacobs lived in Washington, DC, assisting contrabands, nursing black troops and teaching. After the war, she and her daughter did relief work in Savannah and Edenton. In 1868, they traveled to London to raise funds for an orphanage and home for the aged in Savannah. The year before her death in 1897, she was actively involved in organizing meetings of the National Association of Colored Women in Washington, DC. She is buried in Mount Auburn Cemetery, Cambridge. For nearly a century, the authorship of her book was questioned, but a new edition published in 1987 by Harvard University Press named Harriet Ann Jacobs as the true author of Incidents in the Life of a Slave Girl.